Here's a peek at the venues, thrills and spills of Olympic equestrian sports. See show jumpers, dressage riders and three day eventers in action with this collection of Olympic photos. Take a look at how Olympic riders dress, what their tack looks like, and the techniques used to negotiate challenging Olympic riding competition. 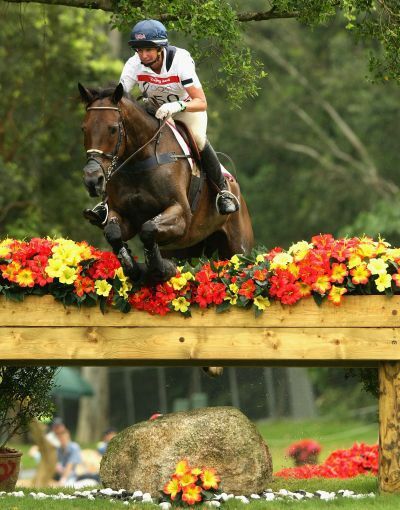 Here, eventer Karen O`Connor and Mandiba tackle the cross-country jumping phase of the Beijing Olympic three day event. Mandiba doesn`t spare an inch as he takes this jump. The white marks on the horse`s front leg is grease that helps them if they should hit a jump. Cross-country jumps are solidly built and made not to topple if hit. Italian eventer Fabio Magni and Southern King V clear a jump in the cross-country phase of the Beijing Olympic three day event. Both horse and rider wear safety equipment. The horse wears protective leg gear. Its shoes have removable `caulks` similar to cleats on a human`s soccer shoe, that can be changed depending on the footing and event. The rider wears a helmet, gloves, a torso protector and tall boots. Eventers often wear team colors on their jerseys and helmet covers. US event rider Gina Miles urges McKinlaigh over a vertical during the in show jumping phase of athree day event. This ride contributed to Miles` individual silver medal in eventing in Beijing. US rider Courtney King-Dye riding Mythilus. King-Dye and her team mates were beaten by fractions for the bronze medals at the Beijing Olympics. Jane Gregory of Great Britain and Lucky Star in the individual dressage competition at the Beijing Olympics. While eventers use only a simple snaffle bit on their horses, double bridles--a bridle with both curb and snaffle bits are used by the dressage riders. The rider carries two reins in each hand. The snaffle rein generally is carried on the bottom and the curb bit between the top fingers on the hand. The curb is a leverage bit that gives more refined control required in high levels of dressage. Gregory is executing a pirouette at the canter. Ideally the back hooves should stay on the center line of the arena, while the front feet canter around in a circle. The horse should be bent in the direction it is pirouetting in. The hind hooves should not be shuffling, and all legs are actively cantering and not hopping. Eventer Heelan Tompkins riding Sugoi on the cross-country course of the Beijing Olympic three day event. Tompkins wears a large faced watch made especially for eventers. This makes it easier for the riders to pace their horse and finish in the preset optimum time. Riders will also have walked the course previous to the competition to plan their approach to each jump and calculate where they will need closely control speed and negotiate terrain. Mary King of Great Britain rides Call Again Cavalier through the water obstacle on the cross-country phase of the three day event. Spurs and a whip are required as there can be no hesitation as the competitors approach each jump. Dutch dressage rider Anky van Grunsven shows intense concentration as she asks Salinero for an extended trot. HRH Princess Haya of Jordan is the former president of the Fédération Equestre Internationale (FEI). All Olympic equestrian sports are run under the FEI rules. Show jumping, three day eventing and dressage are just three of the eight FEI horse sports. The others are reining, combined driving, vaulting, para-equestrian and endurance. HRH Princess Haya is a familiar face at many major competitions such as the World Equestrian Games and the Olympics. This picture was taken at the Equestrian Olympic test event at Sha Tin venue on August 11, 2007 in Hong Kong, China. Canadian Bruce Mandeville and Larissa negotiate a water hazard at the Sydney Olympic Games. You'll notice that Mandeville is not sitting in the forward seat position as he balances Larissa into the watery landing of this jump! Larissa's legs are protected by boots and Mandeville is wearing a chest protector, and of course, a helmet. In show jumping, parting company with your horse means a disqualification. Here Lucas Werthein makes an unfortunate 'unscheduled dismount' during the individual jumping competition at the Athens 2004 Summer Olympics. Garcia and Albin III clear a vertical of rails in style. An airy looking fence like this can be a challenge because a horse may have less respect for it than a more solid looking obstacle. It is a challenge for cross country course designers to lay out a course that is challenging and technical. Here Andrew Nicholson riding Fenicio clears an attractive water jump at the Athens 2004 Olympics. With jumps like this the challenge is not only physical but mental. After all, from the horse's point of view why jump this obstacle when it would be easier to go around it? Caroline Moore of Great Britain rides horse Don Giovanni II rides the dressage phase of the three day event at at the Beijing Olympics test event. The rider is formally dressed for dressage with white breeches and cut-away jacket. Her vest, collar and saddle pad sport her team colors. This horse is being ridden in a simple snaffle bit with a flash nose band on the bridle to prevent him from evading the bit. They are executing a collected canter on a circle. Before 1952 military dress was 'de rigueur' in all Olympic equestrian events as all riders were commissioned officers. It is still common to see riders in formal military dress - with traditional hat or helmet. Here Andreas Ostholt of Germany rides horse Rainman during the Eventing - Dressage at Sha Tin Venue for the Good Luck Beijing test event for the 2008 Summer Olympics. Rainman is being ridden in a full cheek snaffle with a flash nose band. Anna Junkmann of Germany rides horse Cancun during the Eventing Dressage phase at Sha Tin Venue for the Good Luck Beijing. Cancun is demonstrating a collected canter. You can draw a vertical line perpendicular to the ground along the front of his face. He looks relaxed and in control. Junkman is wearing the proper formal attire for a dressage rider. Notice how the saddle flap is cut straight down to accommodate the proper leg position for dressage. This type of saddle would be unsuitable for jumping as jump riders shorten their stirrup lengths bringing their knees more forward. Cancun is being ridden in a snaffle bit with a flash nose band to prevent him from evading the bit by opening his mouth wide. Here is an obstacle on the cross country course at the Beijing Olympic test event. Cross country jumps are made to be solid. They do not fall down if a horse hits them. This photo of USA eventer Laine Ashker and Tsunami was taken at the Beas River venue that hosted the Olympic cross country event during the 2008 Beijing Olympic Games. Drik Schrade is already calculating what needs to be done to negotiate the next jump as his horse Grande Amour lands from an airy vertical. Show jumping is a mental and physical challenge as designers set up courses with many twists, turns, and difficult striding between jumps. Riders need to be in complete control of their horse and horses obedient and quick to respond. Not all negotiations end well. But unlike show jumping cross country riders may remount and finish the course. Here Pawel Spisak and Weriusz test the waters at the Athens 2004 Summer Olympic Games Markopoulo Olympic Equestrian Centre Eventing Park.